View cart “Enable-IT 821P PoE Extender Kit” has been added to your cart. ► Supports 5 Remote PoE enabled CPE units off the same 2-pair of wire – Holy Crap! Put your PoE device/s where you need to and not where you are limited to. Ideal for installing PoE cameras or WiFi Access Points rapidly. Even add up to 4 additional CPE units anywhere along the wiring run – no one else has this amazing capability. ► Beware of cheap competitors as a lot of their LAN devices are banned in the USA due to spyware. The Enable-IT™ 821P PoE Extender (Power over Ethernet) is the fastest encrypted and Secure PoE Ethernet Extender on the planet bar none! Designed & Made in the USA with quality and prideful Craftsmanship! 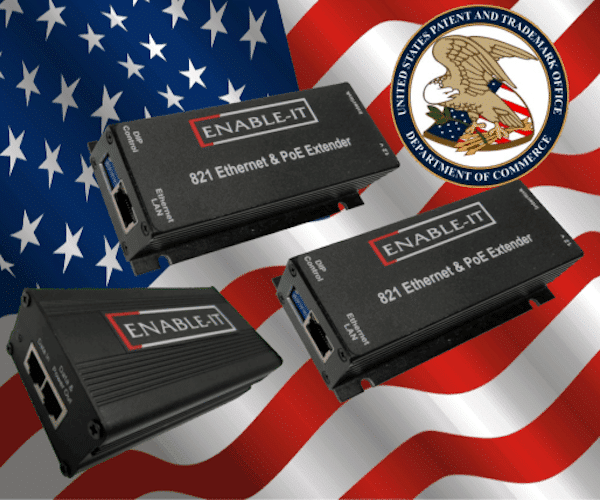 This American-made EnableIT 821P PoE Ethernet Extender kit uses industry LAN standard RJ-45 (8-pin) connectors to make installing in most any environment very easy. We have engineered most of the technical complexity into automatic line adjustments so the plug and go simplicity on your existing or new wiring is a snap. Ethernet Extension Experts designs and manufactures the 821P PoE )Power over Ethernet) Extender kit, along with its entire product line, in the USA that makes us more responsive to customer demanding needs. We use the highest quality materials and craftsmanship. This is trusted a Business Reliable Professional Grade PoE Extender without the high cost of fiber or unsecure wireless. Why risk your business to lower quality imported equipment? The value of your network communications should be a protected investment. Beware of Cheap Chinese “so called Business Use” (not even suitable US Home use) gear that is banned in the US due to discovered hidden spyware. You can leverage existing Telephone wire all the way up to Category rated CAT 7 twisted pair to deploy your extended PoE devices vs expensive fiber that is unable to deliver PoE Power and is susceptible to extreme cold and movement damage. Leverage existing or new wiring that is contiguous all the way up to 2,000ft (609m) encrypted and secure, effectively saving you thousands in labor, administration, and security. Think fiber is cheap? Have you ever priced or paid for fiber troubleshooting? Think again. PoE Ethernet Extender coupled with industrial strength components to survive harsh temperature extremes delivers superior value and capabilities no other competitor can touch. Enable-IT is the seminal creator and inventor of Ethernet Extender and PoE Extender concepts and technology. We are the original trusted source.The US Federal Govt has banned most all non-US made networking products in their networks – Why risk your business using cheap foreign LAN products? ► Insured, Same Day Flat Rate Shipping – US Factory Floor Direct. ► Extended PoE Ethernet over 2 pair new or existing Telephone wiring up to Category rated wiring. Max distance 2,984ft (909m) from device extension to device extension, encrypted and secure.► 1 821P CO unit can support up to 4 other 821P CPE units on the same wiring run! Maximize your wiring for multi-PoE drops.► 821P CPE PoE Output DIP switch to disable PoE and use as a remote LAN port. ► Ruggedized Professional Business Grade mountable casing for harsh environments.► Rapid LAN style installation RJ45 jacks – no programming required. ► LAN Device independence – Transparent to 802.3 Protocols, Applications. and MAC / IP addresses. ► Longest warranty protection included, exceeding any knockoff competitors. (1) Enable-IT 360 56V-61W Gigabit PoE Injector included. CO unit – 12V-1A DC Country Specific (120-260V AC) Power Adapter 2.5mm DC jack included. Enable-IT 360 56V-61W Gigabit PoE Injector included. Ruggedized wallmount black Aluminum casing Optimized for heat extraction and isolation without fans.